In an effort to encourage effective stormwater management practices on public parks, the U.S. Environmental Protection Agency (EPA) Office of Wetlands, Oceans, and Watersheds released a report, Green Infrastructure in Parks: A Guide to Collaboration, Funding, and Community Engagement. 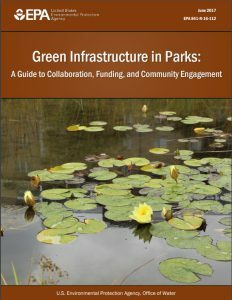 provides case studies detailing successful green infrastructure partnerships between park and stormwater managers from across the country. Additionally, the report offers park managers guidance to match the unique conditions of their land to suitable green infrastructure solutions. Public parks are a natural fit for green infrastructure installation. Typically, parks already contain open spaces that absorb stormwater. Many common park features – parking lots, roads, playing fields, and visitor centers – can be built or retrofitted with minimally invasive stormwater management measures to improve permeability, beautify the land, and minimize runoff pollution.